Next Training Event: no trainings scheduled at this time. All folios I produce have to be okayed by the artist's estate or the artists themselves, and every folio Bruce has transcribed has been approved without hesitation. I must add that the product line I work on includes the most difficult music this company publishes. Click on the cover photos for more information. "This one is uncredited, but it is my transcription. I also transcribed Smoke Gets in Your Eyes, but it did not make it in the book." "Again, not credited, but they are my transcriptions. I particularly like Remember, with its schizophrenic, polyrhythmic playing between the hands in the opening. I switched from Mosaic to Sibelius 1.3 half way through working on this book - the very day I started working at Sibelius. I was twice as efficent working in Sibelius than I was working in Mosaic, and that was on the learning curve! Sibelius did things that Mosaic could not do." Bruce C. Munson transcribed all 8 titles in this volume. Happy Lypso • Jamento • Look Up • Reggae-Later • Renewal • The River • Think Twice • You Can See. "This was my first transcription book for Hal Leonard, although I finished it after the Billy Taylor book, as I recall. I recieved full credit for this book. Monty's playing is superb!" "There is a big space where my credits should be! I met Billy at IAJE a few years after the book came out and he complimented my on my work. Billy is a consumate perfectionist! I also transcribed Early Bird, but it did not make it into the book"
"Finally some credit! There is one mistake in this book - not made by me - a wrong clef change at the end of bar 4 in New Rhumba. This book involved guitar and bass transcription as well - a trio transcription. A few years after the book came out, I met Ahmad back stage at Yoshi's in Oakland, CA. He's incredible as was the concert!" "Again, no credit, but what a great player! " Bruce C. Munson transcribed all sixteen titles in this volume. Bird Lives • Bluesnik • A House Is Not a Home • I Can't Get Started with You • I Remember You • I'll Take Romance • Let's Face the Music and Dance • Little Melonae • Melody for Melonae • My Old Flame • Nature Boy • A Nightingale Sang in Berkeley Square • Sentimental Journey • What's New? "This was my last book for Hal Leonard's Transcription Series. Work at Sibelius became too much for me to continue transcribing for Hal, and I started to get better and bigger engraving/ music prep. jobs. 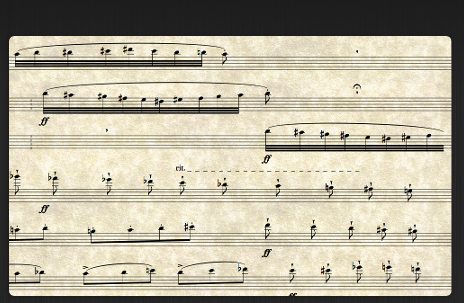 This was the first time transcribing a saxophonist for Hal, and it was very different than my previous work with pianists. Jackie is very free with his phrasing and rhythm, often anticipating or purposley being behind the rhythm section. So this made it challenging from a rhythmic transcription standpoint. When I first heard his version of A House is not a Home, I nearly cried: his playing is so emotional. I had some great phone conversations with Jackie through the process of doing this book. He was truly a one-of-a-kind!" Bruce C. Munson transcribed all seven titles in this volume. "This was a really fun project . Chuck sent me unquantized, freely-played MIDI performances, so it really put Sibelius through its paces in terms of MIDI file importation. I came up with a process by which I worked with the unquantized file and a Sibelius-processed (quantized) file at the same time. I particularly like Ashokan Farwell (the main theme from Ken Burns' The Civil War series) with Chuck's beautiful interpretation. If you purchase this DVD, you will notice that my transcriptions (included on the DVD in pdf) do not match the recorded audio. Again, that is because what I worked with were MIDI performances different from the recorded audio. If you are interested in receiving the MIDI performances or playback files of the transcriptions, please let me know and I will contact Chuck for permission." Bruce C. Munson transcribed and arranged thirteen titles in this volume. I arranged 13 of the 16 songs in this volume of inspirational music, including songs by Faith Rivera, Harold Payne, Karen Drucker, Eddie Watkins Jr., Stefan Mitchell and Michael Gott. This was a fun project, and what is fantastic too is that it comes with a CD of all the songs, and the actual arrangements, that are in the book. I look forward to working on the next two books in the series.